At Conifer we take pride in being an approachable damp proofing company trading on the traditional values of customer service, reliability and quality of work. Our projects are undertaken by our own staff and are properly supervised. As much care is taken in the initial protection of the working areas as in the completed works. Our damp surveys, reports and plans are clear, detailed and are written in plain English to indicate areas of work, and the type of works proposed. The reputation we hold is built not only on the quality of our work but also on the honesty of our reports. We always give truthful and well-informed advice. Conifer work closely with the manufacturers of the waterproofing products that we use to ensure that, whether you require a chemical injection damp course or a tanking to a bank house, you always get the right products for your needs. 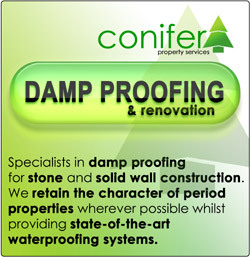 Conifer are damp proofing specialists. We will treat your property with the respect it deserves by keeping work areas sheeted and tidy but also in our approach to, and understanding of, old buildings. By scheduling and supervising the works properly, we endeavour to keep disruption to a minimum for our customers. Otherwise known as Chemical DPC; we use Dryzone Cream and Dry Rods for our injected DPC work. The quality is always reliable and it is a very friendly product both for the installer and for the building as a whole. We always recommend that the internal plaster finishes are removed up to 1.2m (usually the maximum height of rising damp is 1m via capillary action, but this should be checked by the installer as it can be far higher when conditions are right!). We then inject/insert the Dryzone products from the inside of the building into the lowest accessible mortar course at intervals of approximately 115mm or 4.5" and 85% of the way through the wall. The interval is chosen to coincide with the perpendicular joints in the damp brickwork so that the product is drawn (via capillary action again), not only across the course, but also up and down the perpendicular or perp joints, as they are known. This ensures maximum coverage (see the downloadable Dryzone DryRods PDF below). By injecting from the inside of the house we ensure that we get the Dry Rods into the correct mortar course and we can control the operation so that there is no chance of plaster bridging the new DPC - this is crucial. See more about this product on our damp injection page. Once the chemical injection is complete, we plaster the walls with two coats of Dryzone plaster. This can be brought up to 25mm thickness which is usually enough to encompass most damp brickwork installations. This plaster can be used instead of a bonding plaster to level the walls but with the major advantage of being water and sulphate resistant so that it can protect the skimming plaster and decorative finishes. NB: Dryzone doesn't behave like bonding plaster so if you have never plastered with it before it can be a little awkward at first but as, mostly, this product is installed by damp proofing professionals this is probably of little interest to the majority of customers. This product has started to supersede the waterproof render that used to be installed to complete the injection damp proofing system - the advantages are that the product is breathable (suitable for heritage work so ideal for old buildings) and ordinary, off-the-shelf, skimming plaster keys to it very well. The trouble with waterproof render is that once the waterproofer has closed the capillaries in the render, the skim finds it difficult to get a purchase and delamination can result sometimes. See more about this method on our plastering services page. Cavity drain membranes have long been used in basements but they are also ideal for use above ground, particularly in stone buildings, where injection is not appropriate and/or where there is also risk of penetrating damp further up the wall. In most stone walls the mortar coursing can be very random and so the chances of plaster bridging any injected DPC is high. Also the walls often contain voids which can make it difficult to ensure that the product is going to the right place. Lastly, the walls are often so thick as to make drilling unsuitable or even impossible. As long as the membrane can drain the water safely, they make an ideal solution to this problem. 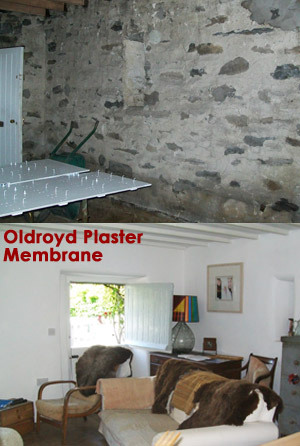 As some membranes can be plastered onto directly, we can often keep much of the shape and character in old walls using this method as shown in the barn conversion picture opposite. No-one would suspect that the plaster wasn't original to the building but it is completely dry and, due to the cavity, much warmer than the original wall which can also offset any condensation issues too! See more about this system on our Cavity Drain Membrane page. These are another valuable weapon in the fight against damp and can be used in various situations both on walls and floors. The membrane is glued in place using specialist Drybase Flex Adhesive. This can be extremely useful where cavity drainage is not possible and injection is not appropriate either. Furthermore as a DPM (damp proof membrane) this type of membrane can be ideal as it is completely waterproof (and so is the adhesive) and because it is stuck down to the floor it is great to follow with almost any kind of floor finish thereafter. From tiling to screeding, Drybase Membrane will not move or leak if installed correctly. For more about this product and its uses see our Drybase Flex Membrane page. Vandex BB75 can be applied to blockwork, render or concrete and if installed correctly can handle up to 6 bar of pressure (positive or negative). Chemically it is a clean product and can even be used in potable water situations. For more about this system see our Tanking page. For damp proofing services call us for free advice or send us your enquiry via email and we will get back to you as soon as possible! Our Damp Proofing service includes: Damp Proof Course Injection, Chemical DPC, DPM, Chemical Injection (Dryzone Dry Rods), Vandex Slurry Tanking and Membrane Damp Proofing Systems across the regions of Cheshire West, Chester, Shropshire, Shrewsbury, Telford, Oswestry, Powys, Welshpool, Newtown, Ceredigion, Aberystwyth, Mid Wales, Clwyd, Wrexham, Gwynedd and North Wales. Find out more about damp proofing and related areas from our blog.